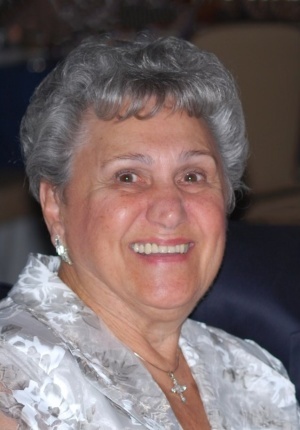 Rosalie DePinto (nee Rivoli), age 89, passed away peacefully on Friday morning, Nov. 9, 2018, after an 18 year battle with cancer. She was the beloved wife of Donato DePinto; loving mother of Michael, John (Anne Marie), Palma (John Shannon) and Lori. She is also survived by 4 adoring grandchildren, Kerry, John Daniel, John Michael and Thomas. Rosalie was born in Brooklyn on March 11, 1929 to Tom and Florence Rivoli; a dear sister to Sara Gerbino, Louis Rivoli and Charlotte Klaar. and was predeceased by her brothers, Phil and Joseph Rivoli. She is also survived by many loving nieces and nephews. Rosalie was a longtime South Beach resident. She served as a lector in Holy Rosary R.C. Church and a Eucharistic Minister at Saint Michael The Archangel Catholic Church in Hudson, Florida. She was a long-time member of the Columbiettes. She loved to garden and was an extremely talented seamstress. She worked at Bayley Seton Hospital as a Radiology Department clerk until she retired to Florida in 1995. She will be missed dearly by her family and friends. Memorial Service at Martin Hughes Funeral Home, 530 Narrows Road South. Mass of Christian Burial will be celebrated at Holy Rosary R.C. Church on Friday, November 16 at 10:30 a.m. Interment to follow at Resurrection Cemetery. Family and friends will be received on Thursday, Nov. 15 from 4 p.m. to 9 p.m. In lieu of flowers, donations may be made to St. Jude Children’s Hospital (https://www.stjude.org/give/memorials-and-dedications.html) or Memorial Sloan Kettering Cancer Center (https://giving.mskcc.org/ways-to-give).